I have finished a second UFO on my list. Yippee! This is another charity baby quilt for our local quilt guild. They provide the fabric and batting. I provide the thread and labor. It was simple to piece since it was just 6″ squares. But it was plain. It needed something that would soften it up a bit. So I decided to take this opportunity to practice another FMQ design. This is a simple paisley. It was fairly easy and probably the first time I could honestly say I enjoyed FMQ on my home machine. What I found difficult was trying to get myself out of tight spaces and filling in spaces that were too small for a paisley. I tried several things… some worked, some didn’t. But that is how it goes when you’re trying something new and practicing. This was a good square. It’s so pretty! As much as I like this design, it is very thread heavy. 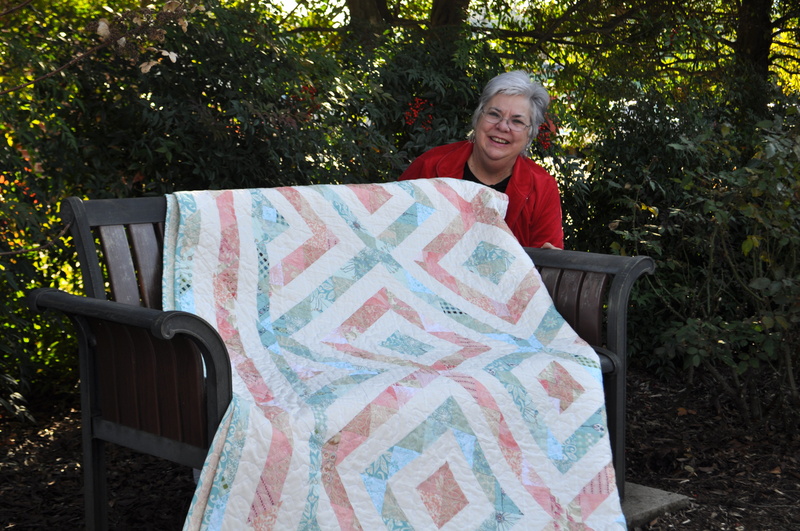 It took 2-1/2 spools of thread to quilt this 36″ x 42″ baby quilt. So, although I really like this design, it might work best featured in a smaller area rather than as an overall design. One more UFO down… many more to go. I’ve been trying to write this post for about 2 weeks now. Actually, that’s better than I thought… I thought I was 3 weeks behind, so being only 2 weeks behind makes me feel somewhat better. I had the opportunity to use a long arm right before Christmas, and… I FELL IN LOVE! IMMEDIATELY! How did this happen? I love how it gives you such a large area to work with. Instead of having a small 8″ x 8″ or so area that I could quilt before having to ‘rearrange’ a huge pile of fabric on my lap and desk, I had a huge approx. 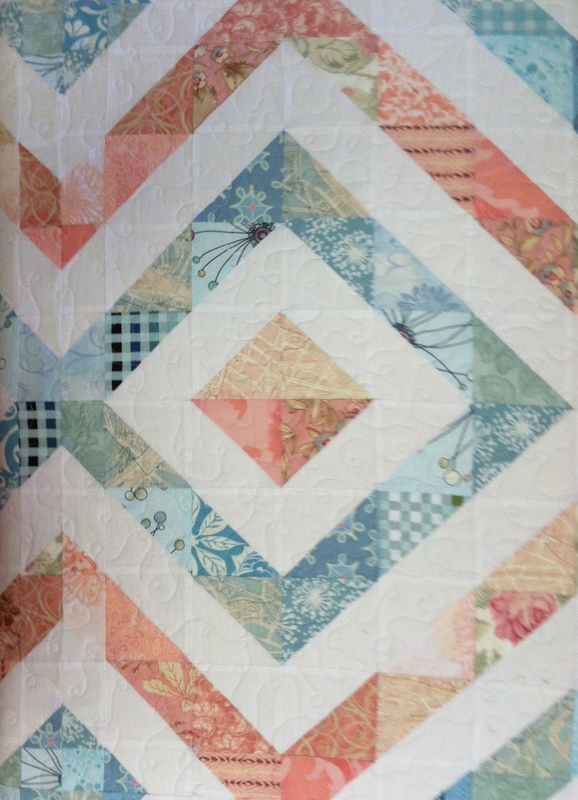 24″ x 96″ area to quilt. And then to move to a new section — just undo a couple of gears and ROLL the quilt up a few feet. It’s so easy! 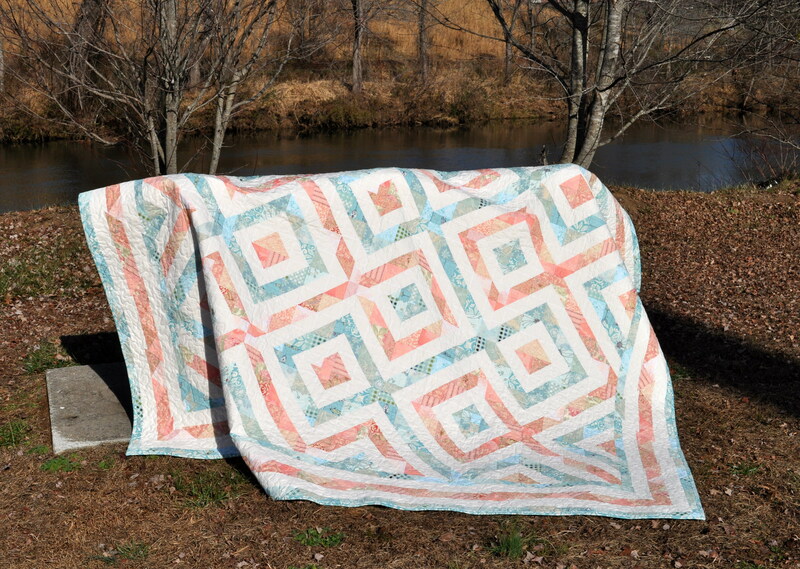 I love how it keeps all layers of the quilt taut and together, WITHOUT pins! Oh my gosh — NO PINS! I didn’t have to stop and remove a pin every 30 seconds, or try to scooch past it and end up hitting it anyway. 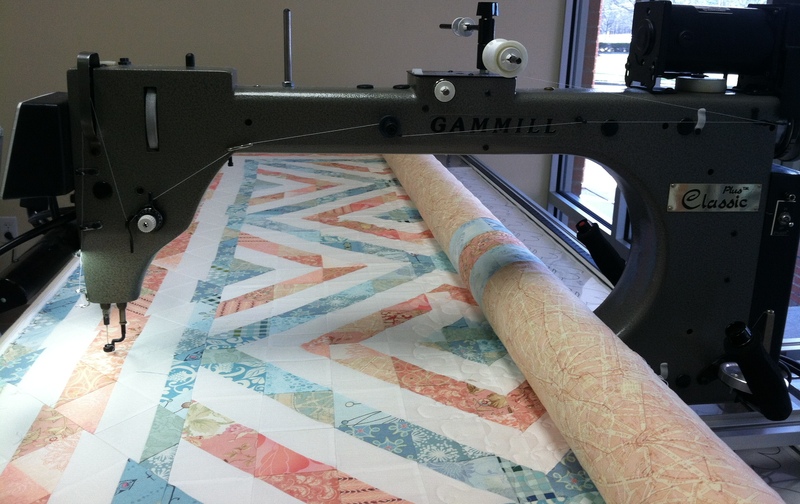 And even though the top and bottom edges of the quilt have to be pinned to the machine (this quilt shop uses zippers to attach it to the machine), pinning the quilt to the machine is somewhat faster than pinning a quilt all-over. 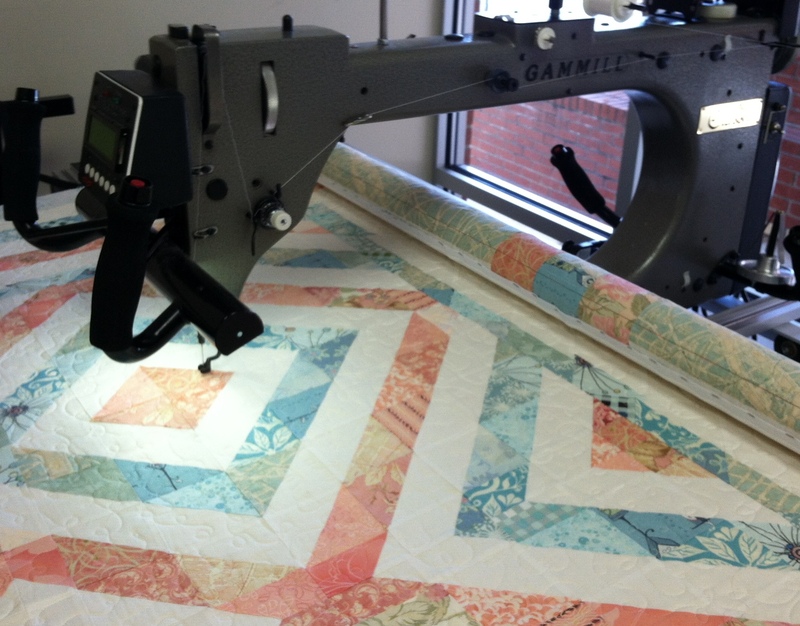 I love how it’s so much easier and smoother to free motion quilt. Free motion quilting on my home machine is like trying to write while holding the pencil still and moving the paper underneath. How is that even doable? But quilting on the long is similar to writing — you move the pencil (machine) over the paper (quilt), so it’s a more natural movement. These 3 things add up to HUGE time savings. I quilted a queen size quilt in less than 5 hours! (not includng pinning) Can you believe it? Granted, the quilting isn’t dense, and I didn’t do any fancy designs. I did an overall meandering loop-d-loop design. But it would have taken me probably 3 times that long on my home machine. It seriously took me less than 5 minutes to realize that a long arm is the way to go. As if I didn’t want one already, I want one even more now. And I didn’t even get a chance to use the Phaff with all the built-in designs… I can only imagine that that one is even more fun! And, my parents loved it! Up to now, I have made mostly baby and lap quilts. But now that I have experienced the long-arm, I see more large quilts in my future. Oh, I can’t wait. But no more half-square triangles… NEVER AGAIN! I can’t believe it! I missed my blogiversary by 3 days. One year ago, I posted my first blog. And boy, was it scary! Since then blogging has become easier, just as I knew it would; but that first blog, that first time putting myself out there, was really scary. But, it’s always good to step out of our comfort zone and try something new. Since then, the blog has seen a few changes. Originally it was going to be a little bit of quilting, a little bit of homesteading, and a little bit of activities with the kids. And there has been some of all of that. But my passion really is with quilting and crochet, when I can find the time, so that is the direction I have been heading in lately and probably will continue down that path. It’s really neat to read some of the older posts to see what was happening back then. It was 79 degrees outside today — in December! — in North Carolina! Our normal this time is year averages around 45-50. So 79 was a true blessing, and I took my computer outside and worked most of the day to take advantage of it. Then, I found it quite hilarious to read my first blog and see that it was 73 degrees that day — in December! — in North Carolina! I guess 70s aren’t all that uncommon in December after all. And in two days, they are calling for the high to be 38 with a chance of sleet and freezing rain. That is going to be a huge shock to the system! But I won’t be here… Nope, in two days I will be heading to Florida and will have this view from the deck of the cruise ship. I can’t wait!!! Otherwise, I can’t believe how fast time is flying. I am no where near ready for Christmas, and my 13-year old continues to count down the days for me. Only 19 more days to go! Oh, joy! I did finish one thing this week. We do an angel tree each year at work where we sponsor and buy Christmas presents for an under-privileged family in the local community. 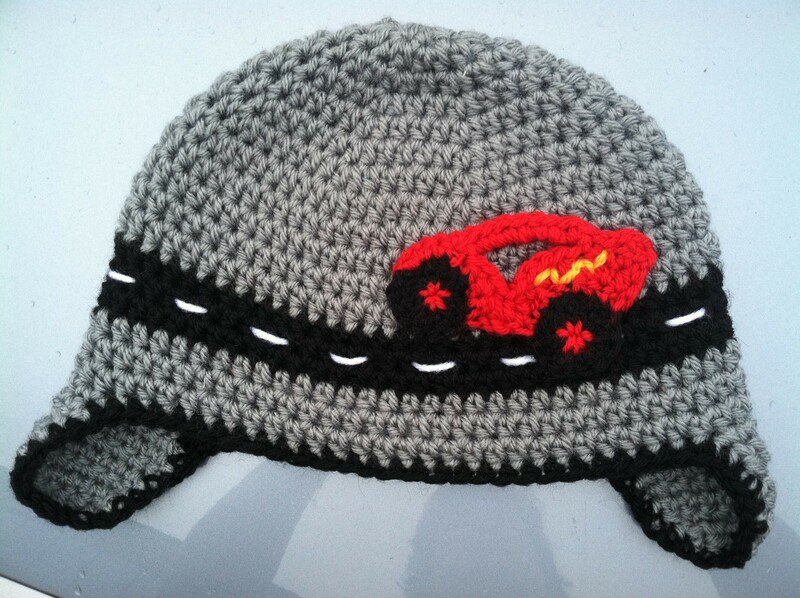 So, among other things, I crocheted a hat for a 5-year old boy in the family and that is my finish for the week. Yes, it’s a crochet finish again. Sorry, it’s just that the quilt I’m working on is HUGE and it’s going to be 2-3 more weeks before it is finished. But I am working on it as much as I can each week.